Extract essential information stored in BlackBerry OS backups. Elcomsoft Blackberry Backup Explorer allows forensic specialists investigating the content of devices running BlackBerry OS 5, 6, 7 and 7.1 by extracting, analyzing, printing or exporting the content of a BlackBerry backup produced with BlackBerry Desktop Software. !Note: the software does NOT work with BlackBerry 10 backups (created using BlackBerry Link).! Elcomsoft Blackberry Backup Explorer employs the only feasible method of accessing information stored in BlackBerry devices. BlackBerry devices are secure, making it difficult to directly access information. However, the information can be backed up into a file by using BlackBerry Desktop Software. Most users create regular backups of their smartphone devices. If no fresh backup is available, forensic specialists can back up information onto a PC with a BlackBerry device on hands. 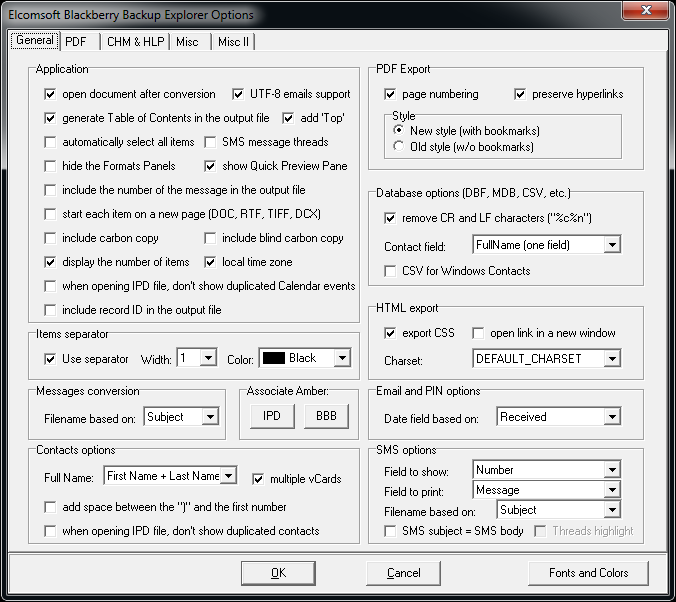 Blackberry Backup Explorer can access encrypted information stored in password-protection backups if the original password is known or recovered with Elcomsoft Phone Breaker. Elcomsoft Phone Breaker grants forensic access to protected information stored in BlackBerry devices by recovering the original plain-text password. BlackBerry backups contain essential information stored in the device. User data such as email, SMS and MMS messages, Web browsing history and cache, call logs, pictures and photos, contacts, calendars, appointments, and other organizer information are stored in BlackBerry backups. Access to information stored in BlackBerry backups can be essential for investigations, and is in high demand by forensic customers. Elcomsoft Blackberry Backup Explorer offers forensic specialists, investigators and government authorities a quick and easy way to access to all information contained in BlackBerry backups. A simplified, affordable version is available to commercial customers. Elcomsoft Blackberry Backup Explorer supports BlackBerry backups made with PC and Mac versions of BlackBerry Desktop Software. One can export information from BlackBerry backups into a variety of human readable formats, including PDF and HTML. DOC, RTF, PDF and HTML files are created with hyperlinked Table of Contents. The data can be exported into a PDF, HTML, CHM, RTF, HLP, TXT, DOC, MDB, XLS, or CSV file. PDF files can be securely encrypted or access restricted as an option. Messages sent and received with a BlackBerry can be exported into series of EML, in turn, can be dragged and dropped into Microsoft Live Mail or Outlook Express for easy access. Alternatively, messages can be exported into multi-page TIFF or DCX images. Contacts can be converted into VCF (vCard), email messages into MSG (Outlook), and calendar events to VCS (vCalendar) formats. Elcomsoft Blackberry Backup Explorer comes with full command-line access, allowing to automate the processing and exporting of BlackBerry backups. With command line, the launch of a single batch file could export the entire content of a BlackBerry backup into a human-readable PDF or HTML file. Elcomsoft Blackberry Backup Explorer comes in two editions: Standard and Professional. The Professional edition is offered to government officials, criminal investigators and forensic authorities. The simplified Standard edition is affordable enough to be used by consumers and in commercial organizations. Encrypted BlackBerry backups are supported if the password is known or recovered with Elcomsoft Phone Password Breaker. Supported if the password is known or recovered with Elcomsoft Phone Password Breaker.